THE CARIBBEAN FA XI had a close up of what life might be like in the fourth division of England's Football League when they visited Crystal Palace in foggy London town tonight. They spend much of the time chasing shadows on the floot lit Selhurst Park pitch and even the goal they got was put in for them by the opposing full back. While crashing to this heavy defeat, the West Indies side were given an invaluable lesson in the basic arts of football. Main point for them to note was the way their opponents made use of the open spaces. They were also shown up in ball control. The one lesson that Palace did not ram home was surprisingly in view of the score how to shoot. For the home side who last Saturday set up a club scoring record in their 9-0 win over Barrow in a League match they would have had still more goals if they had found the target earlier. Gomez alone stood out for the tourists. He played a hero's part to keep the score at least within credible proportions. His several brilliant saves saw him mobbed by schoolboy fans at the end of the match and cheered off the field by the crowd of over 6,000 — the biggest to watch the tourists so far. The tourists suffered from the cold on this raw and misty night. Midway through the first half left back Tyrone de la Bastide went off with cramps and substitute Herbert Braithwaite stayed until the interval when he went down with the same complaint. This brought about a reshuffle with Sydney Bartlett coming on at inside right. One cannot over estimate just now much the West Indies side were affected by the adverse conditions. Even Crystal Palace took some time to get going, and in the first 20 minutes while they were still warming up the Caribbean side had their few danger moments. Centre forward Alvin Corneal provided most of them with some intelligent through passes. 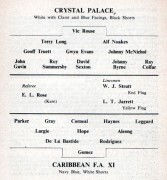 After 23 minutes, however, inside left Gerry Priestly gave Palace the lead and from then on it was almost a fight between Gomez and the Palace attack. Centreforward Tom Barnett scored from close range in the 36th minute, and left winger Ray Colfer got a third soon afterwards. A Roy Summersby penalty put Palace four up by half time and within a few minutes of the re-start Barnett added two more. Left back Alf Noakes then put through his own goal to give the tourist their only score when he was harassed by the West Indies left winger Owen Parker. But that was just about the Caribbean side's last say in things, and Palace piled on five more goals through Barnett, Priestly, Colfer (2) and Noakes. ANTHONY HILL, St. George's College, Jamaica and West Indies footballer, who represented the Caribbean soccer team in their current tour of England, returned to the isalnd yesterday evening by BOAC from London. Hill, who left the island last year to study Law in the United Kingdom, will be entering the University College of the West Indies on Monday, and this time he will read for a degree in Economics. In an interview at his home last night, Hill denied reports that his reason for coming home was on account of the discrimination which existed among the team. "The team on a whole never really clicked," he said, "but goalkeepers, Son Baptiste and Pat Gomez, together with full backs Tyrone de la Bastide of Trinidad and British Guiana's Hubert Braithwaite played well. Individually, Sydney Bartlett, Owen Parker (Jamaica), and Alvin Corneal of Trinidad, were our best forwards."